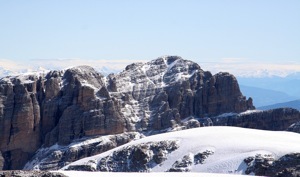 This mountain is located near the resort village Madonna di Campiglio. 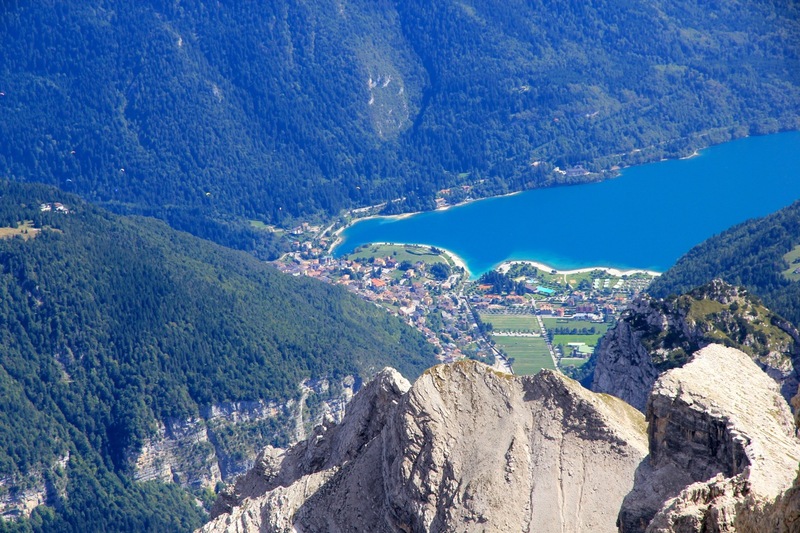 This village is north-west of Trento and can easily be reached from the big freeway connecting Innsbruck (north) via the Brenner pass with Trento (south). 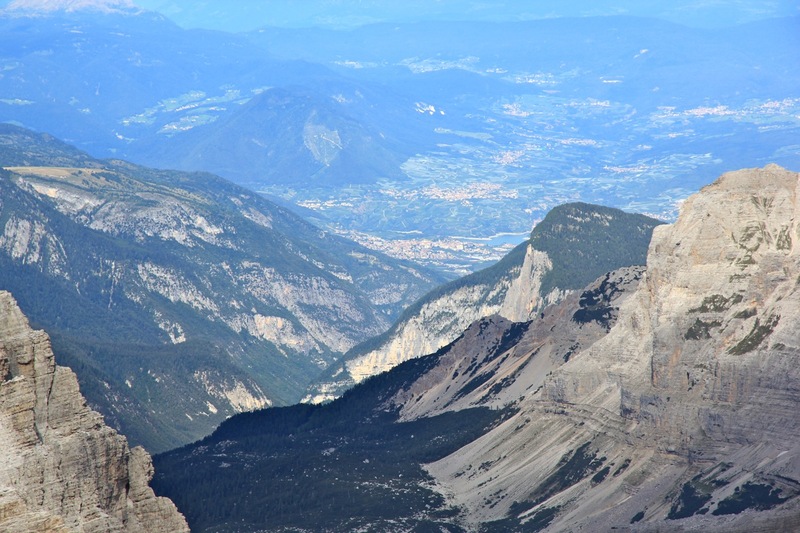 From Trento,one can either head west on SS45, connecting with SS237, then north on SS239, or go north on A22 (towards Innsbruck), then go west on SS43 connecting with SS42 to Dimaro, finally south on SS239. 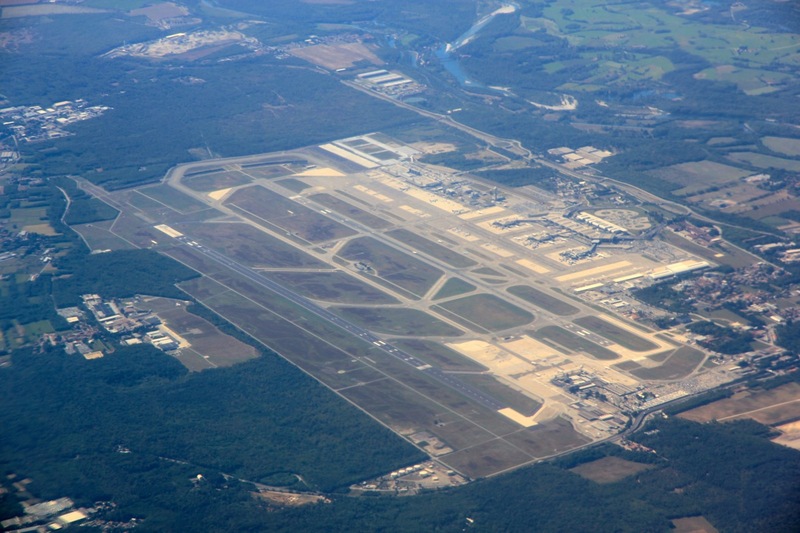 One can also drive north-east from Milan via Bergamo (Hwy. SS42 via Passo di Tonale), then right (south) in Dimaro on SS239. 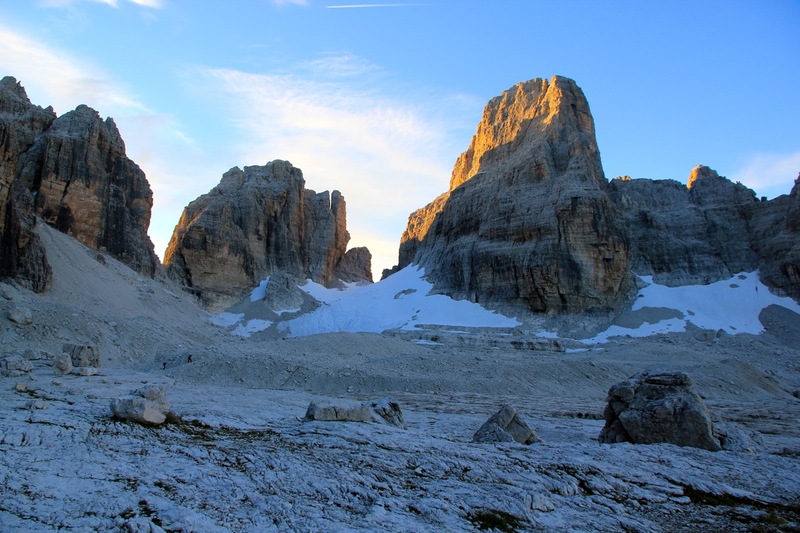 Madonna di Campiglio is about 20 kilometer south from Dimaro. There is a big tunnel bypassing Madonna di Campiglio on its west side. You should exit into Madonna di Campiglio from the south end (downhill side) of this tunnel. Drive across, ie. do not go north towards the center. 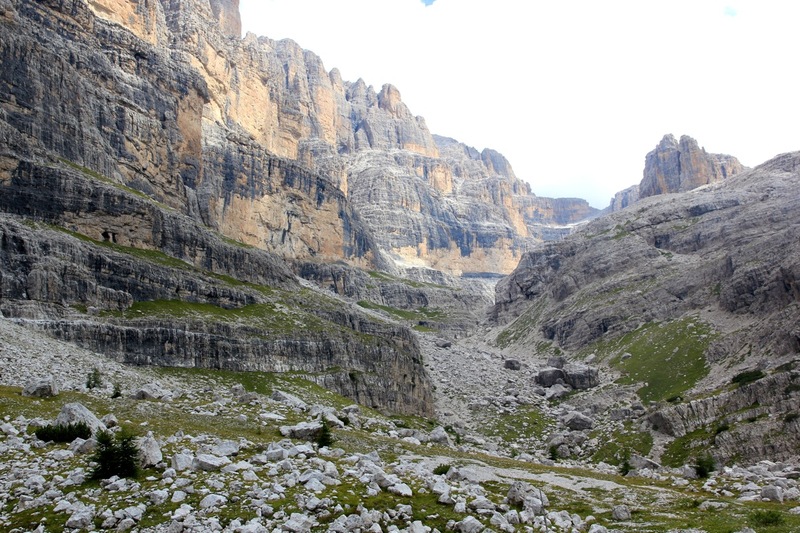 Cross the river and look for signs to Rifugio Vallesinella. You will eventually make a right turn in order to get onto this narrow (but paved) road. There are people collecting toll, in 2009 this was Euro 7 for an overnight stay. 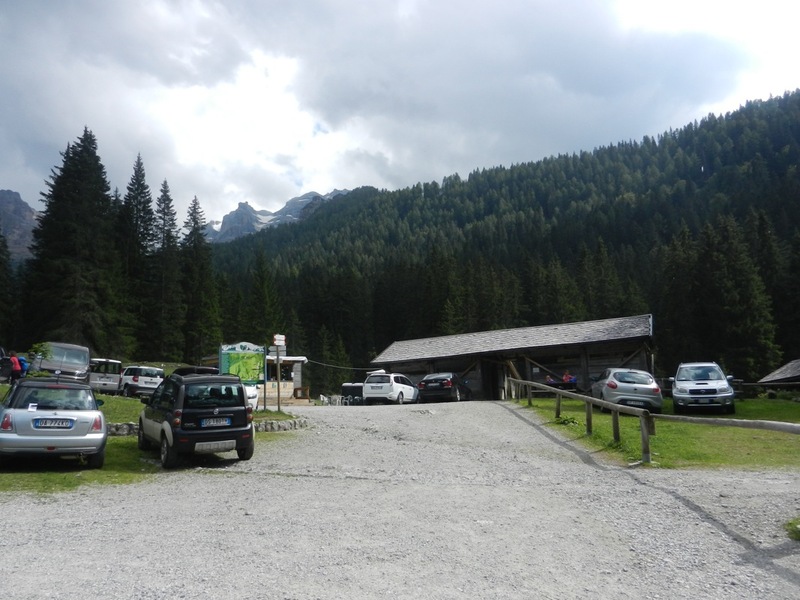 Follow this small road until you arrive at a pretty big parking area at Rifugio Vallesinella. This is the trailhead, location N46:12.380, E010:51.145, elevation about 1520 meter. From the parking, descend slightly in order to cross the river. Check that you start out on a trail with signs for Rifugio Brentei. 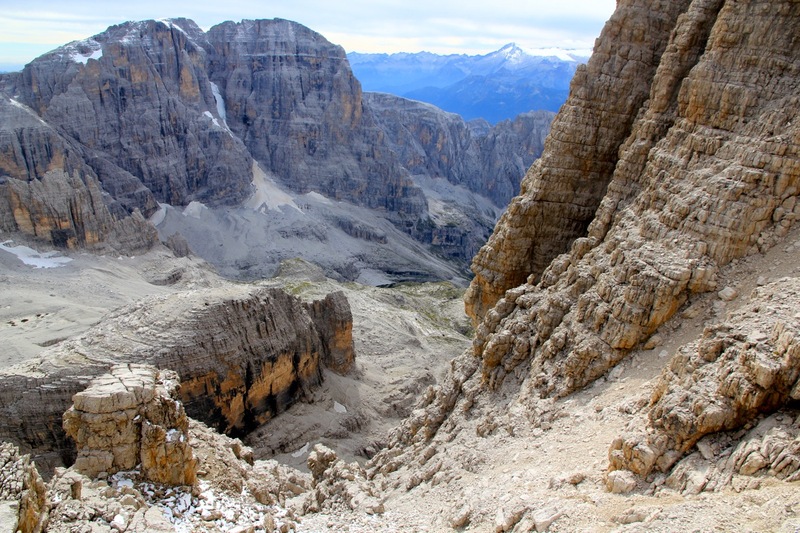 The trail (no 317) now ascends the hillside and emerges on a ridge by Rifugio Casinei, elevation 1850 meter. Continue along trail 318, with signs for Rifugio Brentei. After a little while, trail no 328 forks left, while you continue straight on trail 318 until you arrive at Rifugio Brentei, 2175 meter. The time to Brentei is normally less than 2 hours. 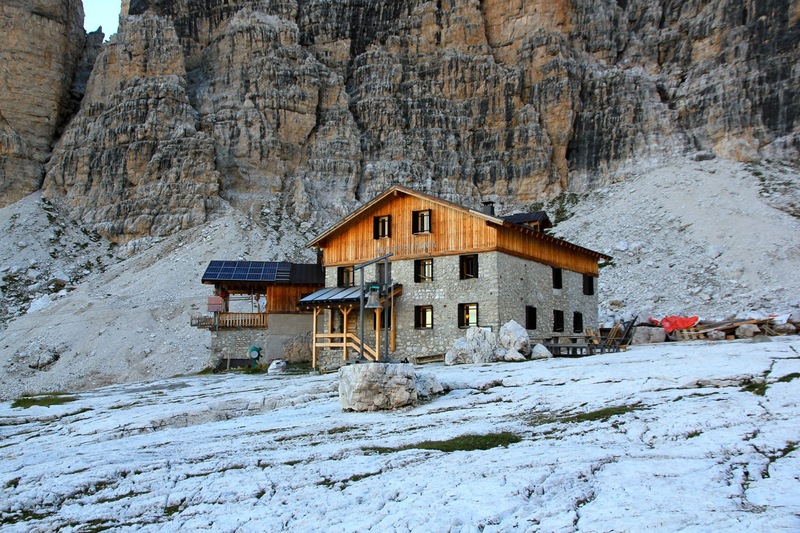 This is a possible place to spend the night, with a bit more time, then consider to proceed to Rifugio Alimonta. You then turn left just before Brentei and follow the signed and marked trail up the valley to Alimonta, this is perhaps 15 minutes beyond the place where the climbing route starts. Hiking time from Brentei is about one hour. 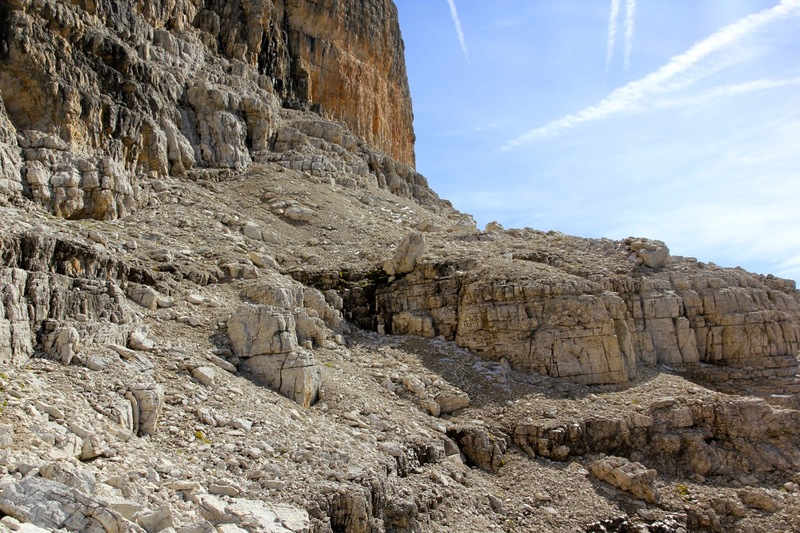 The climbing route starts where the trail (uphill) from Rifugio Brentei has reached more level ground at the very beginning of a flat valley. 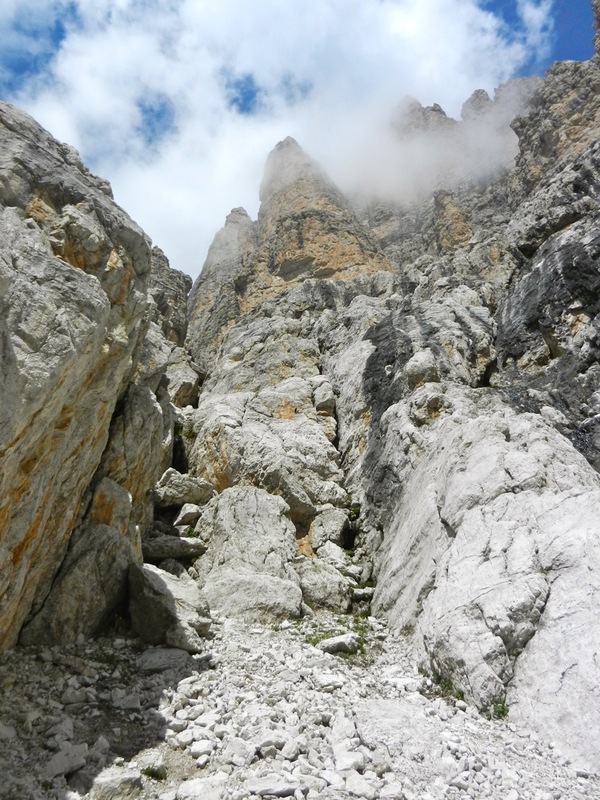 The trail to Rifugio Alimonta makes a right turn here in order to bypass a minor cliff band. This location is N46.17709 , E010.88954, elevation about 2470 meter. From the point where you leave the trail, turn left and look at this terrain. 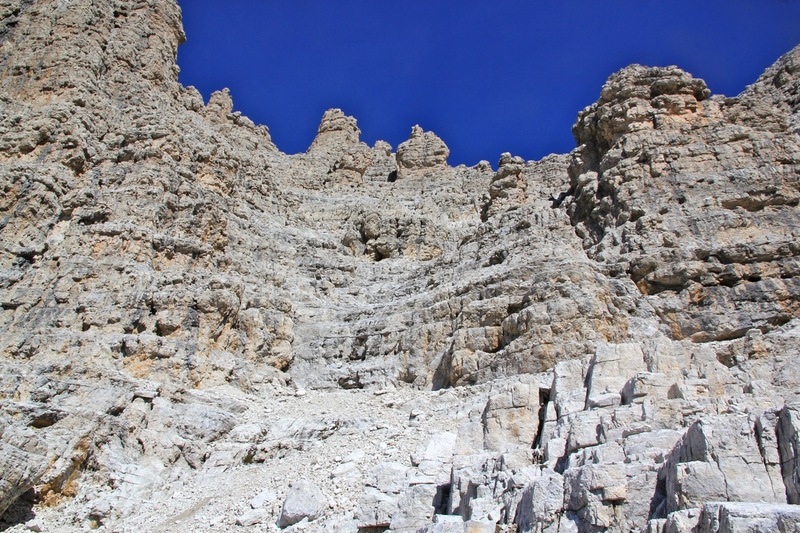 Proceed up the lower scree and into the narrow gully, pass a rock on its right side, then cross left and gain the ridge on the left side of the gully via an easy step. 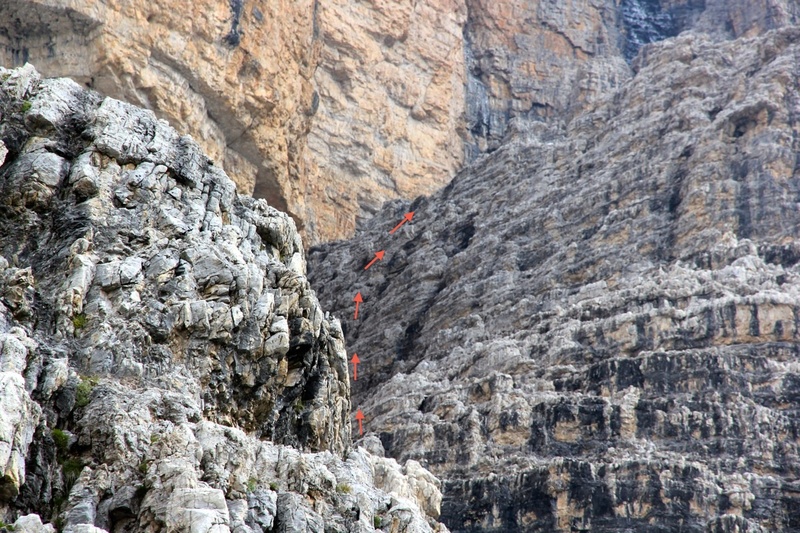 Climb up the ridge as outlined by arrows on the picture. 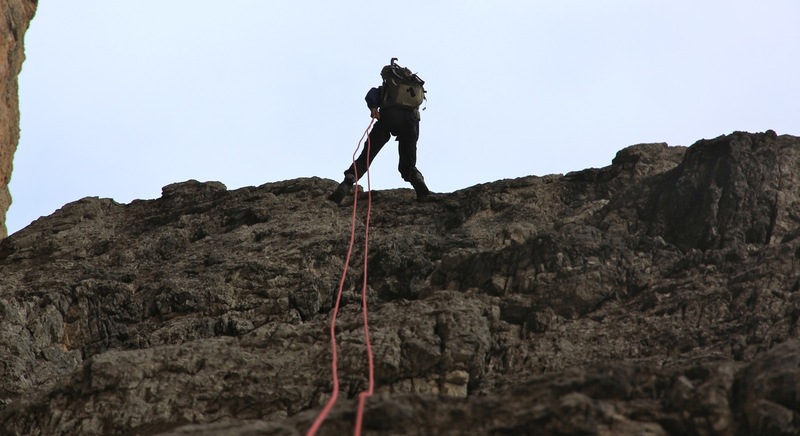 The climbing consists of a section with (YDS) class 3 followed by two separate, but short steps each at class 4. 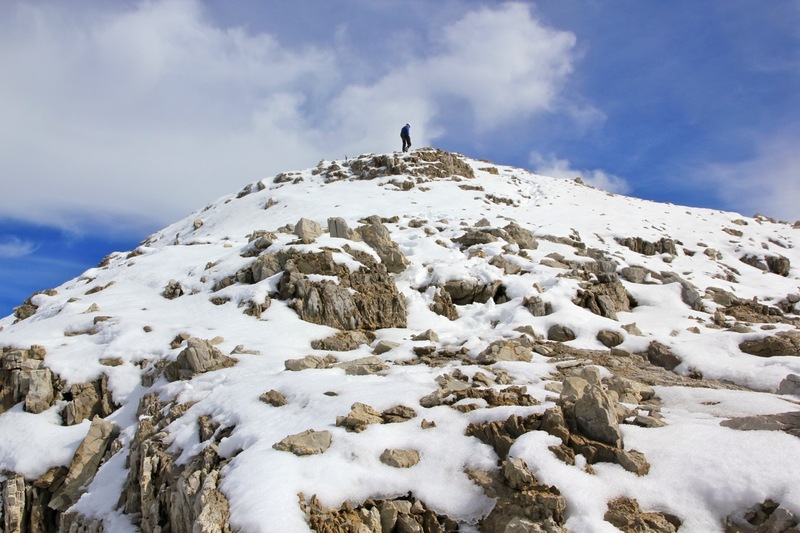 Once on top, continue uphill on scree and gradually turn right, following a vague climbers trail. 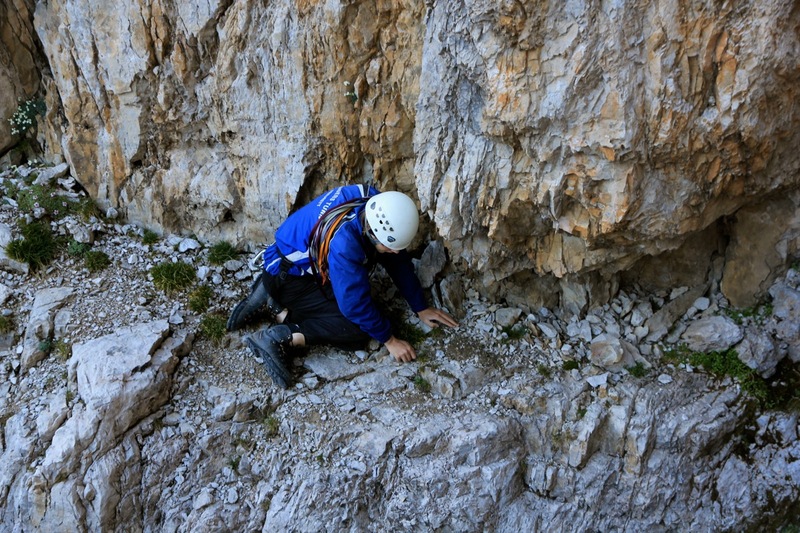 Traverse further and reach a narrow cut in the rock that may be bypassed on an interesting ledge. 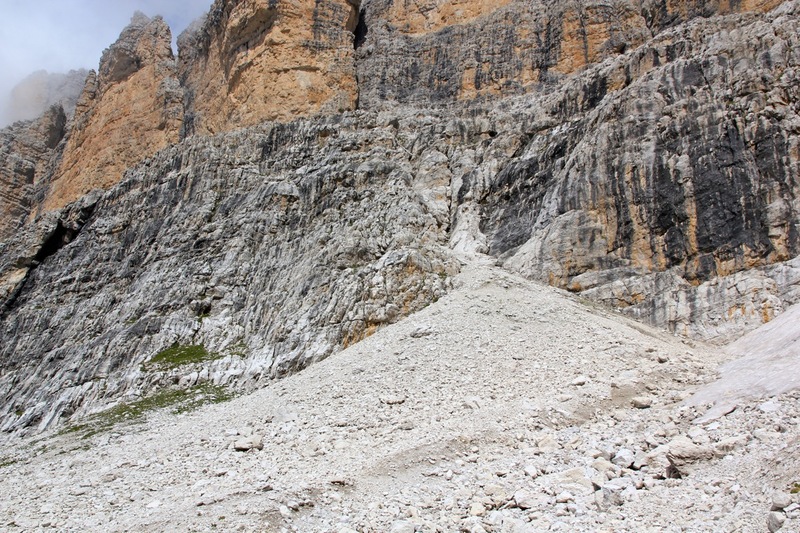 Next, the route climbs higher (easy) and turns the corner to reach the main gully that separates Cima Mandron (above you) from Cima Brenta (further right). The gully may be crossed most easily by going a bit down, then ascend easy rock on the opposite side and traverse into the gully reaching it above a huge chockstone. 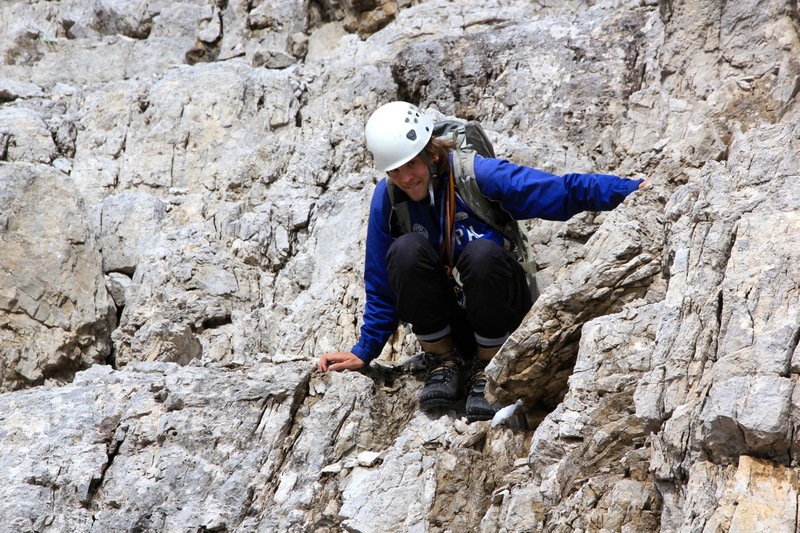 Continue a bit upwards in the gully, then traverse right onto a system of ledges. From here, climb the wall above you. There are many ledges, but also somewhat steeper sections and the overall steepness of this wall is considerable. 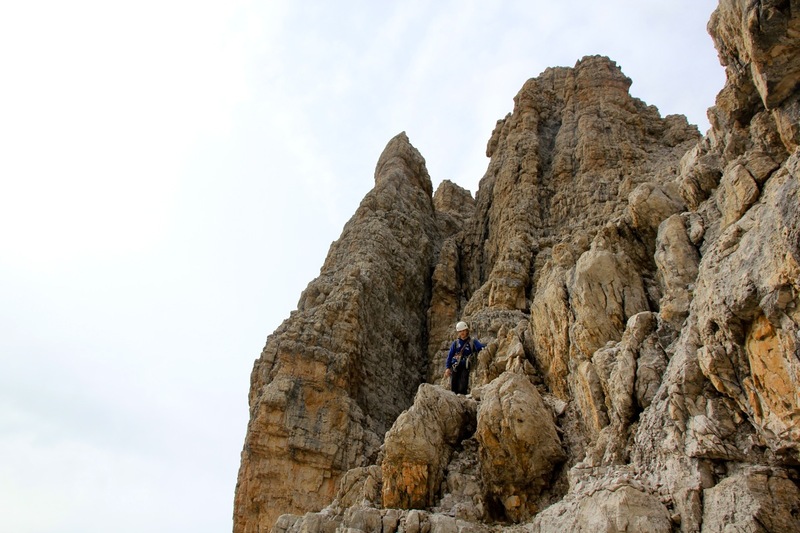 One may decide to protect this climb with a rope depending on experience and confidence. 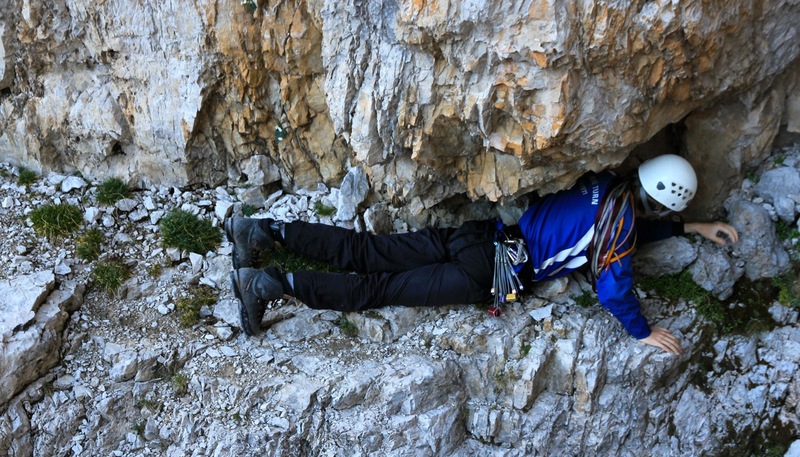 The climbing is (YDS) class 4, there may be a pretty complex easiest route, however, there are many variations possible. At the top, the slope becomes less steep. The route continues uphill, marked with a couple of cairns. 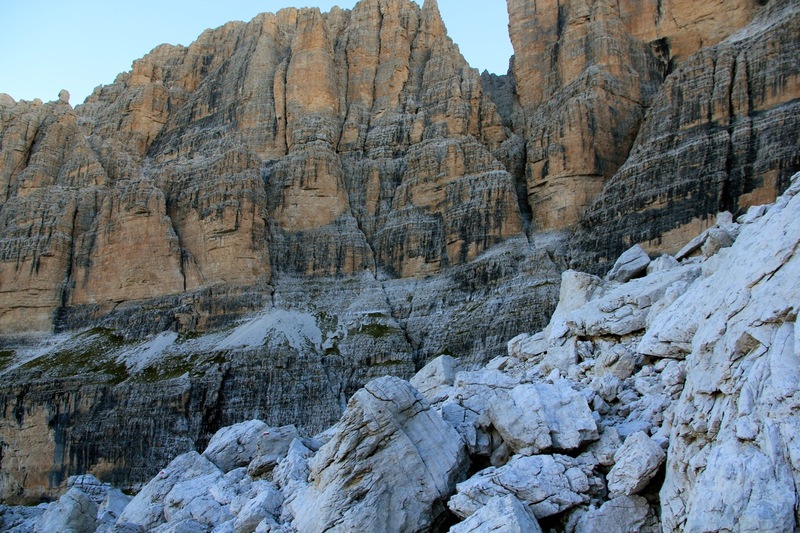 It is extremely important NOT to start a traverse right along what looks like a nice, broad ledge. Rather, continue to climb uphill to the highest ground that is easy to reach above you. 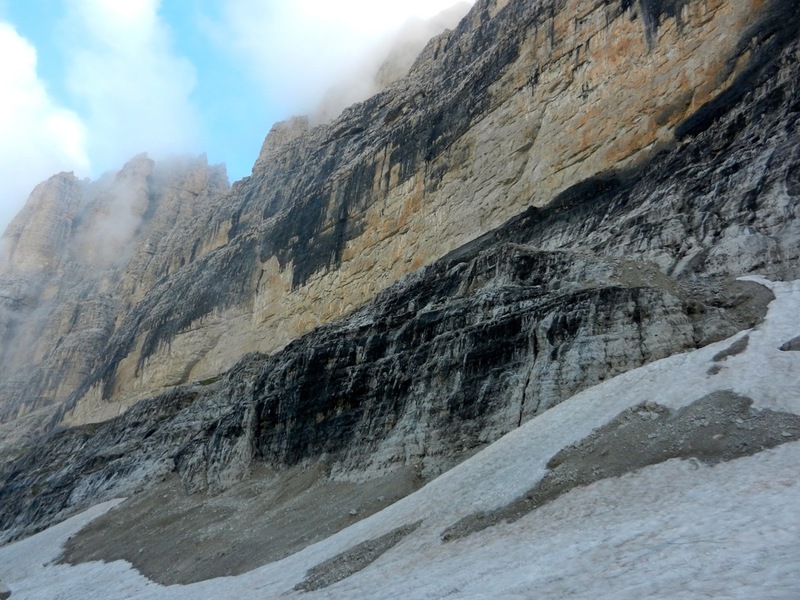 From this level, a traverse along a very nice, broad ledge will lead into the lower part of a large amphi that comes down between the west and the east summits of Cima Brenta. 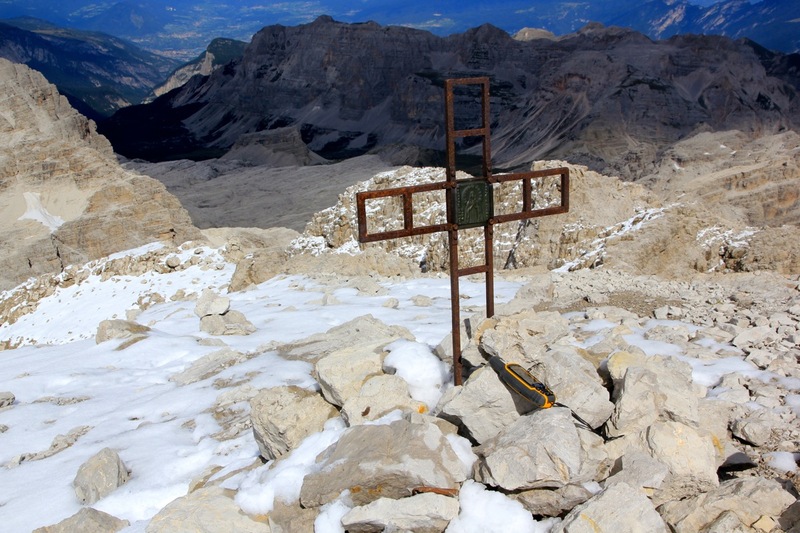 The remaining part of the route is well indicated in this picture taken from the summit of Cima Tosa. Climb a crack (YDS class 4, picture from descending) on the right side, this is further right than arrow 8. Next, pick your way on ledges gradually leading left and continue a short passage in the main (left) gully. (The previous picture is looking down this section.) 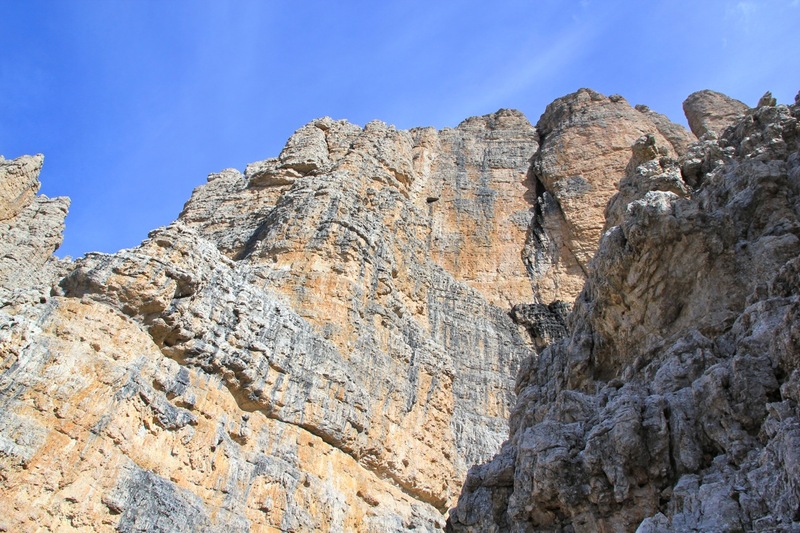 Subsequently, move a bit more right and find a way on many ledges with short pitches of climbing in between them. Counting from the summit (see picture), our route went right from below arrow number 4, across to the gully that then runs uphill to the lower part of arrow number 2. The route indicated by the arrows 3-4 is also possible. 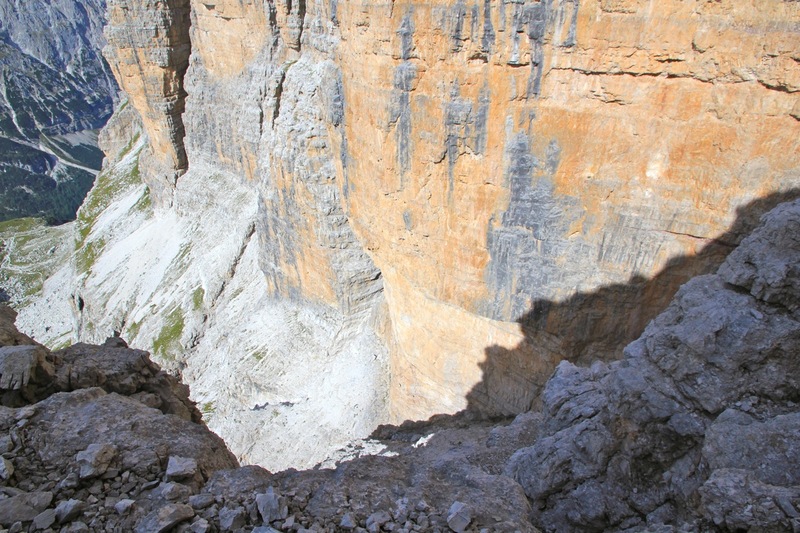 We connected with the gully as explained above, then scrambled to the top ridge somewhat right of the lower part of the connecting ridge between the west summit (lower) and the main (east) summit of Cima Brenta (as referred to in the picture). The top ridge can then easily be followed to the summit. 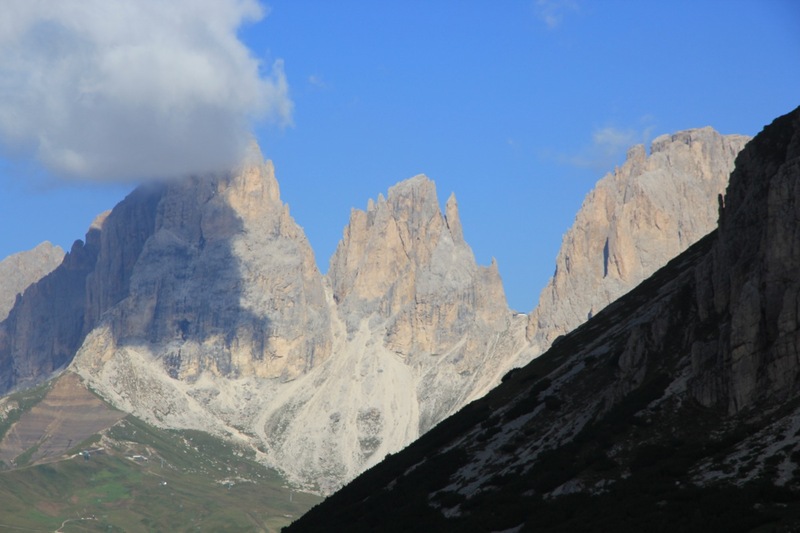 After our successful climb of Antelao, Åke and I slept a second night at rifugio San Marco, then left after breakfast and drove a scenic route across to Madonna di Campiglio. Åke needed new mountain boots and the town had siesta until 1500. Very unfortunate, but we decided to wait until the store would open. Åke got his new Sportiva (light) mountain boots, we then drove onwards to the trailhead. Starting at 1530, we hiked the very scenic trail and arrived at Rifugio Brentei at 1730 well ahead of dinner. 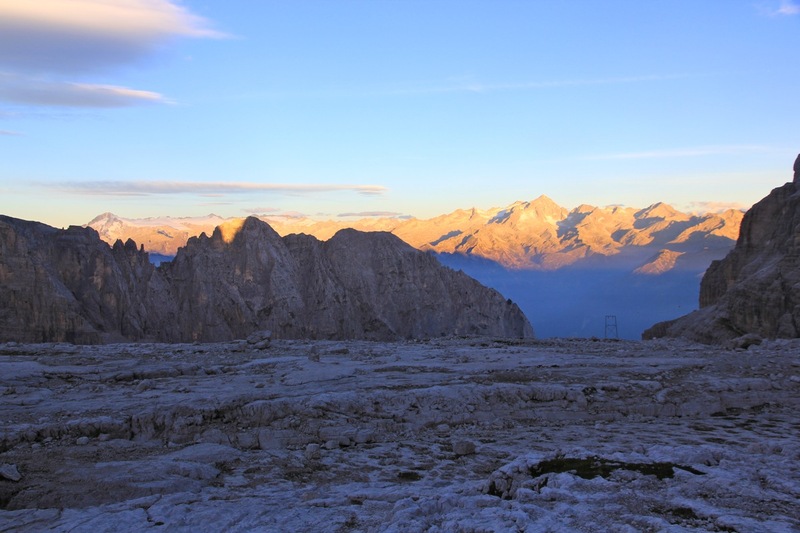 The next morning, we left at 0700 and hiked the trail uphill in the direction of Rifugio Alimonta. According to our description, we should continue straight into a narrow valley where the trail turned right, then locate a circular depression. This made perfect sense and we proceeded up the (narrow) scree and through the gap ahead. Up there, we found the circular flat area, largely covered by snow. The next thing was to locate a gully/chimney crossing the cliff band. This did not look quite right, but a passage did exist and we explored it. Åke then pointed out that we were supposed to climb up under the summit of Cima Mandron, while we were clearly below Cima Brenta. Obviously, something were wrong and we returned back down to where the main trail between Brentei and Alimonta turned. Here, we quickly identified the correct chimney - the description on Summitpost had been very misleading, we had wasted a couple of hours. Our problems were not over. As I started up the ridge going parallel with this chimney, it became clear that Åke felt uncomfortable. We then climbed roped, protecting this section, obviously more time elapsed. I sensed that time was running out and that Åke still did not enjoy the climb, the conclusion was easy - I suggested that we should turn around and descend. Thus, we descended carefully back down, then hiked back out to the car. We still had a pretty long drive in order to get to Ascona in Switzerland, where I would attend a conference the next 4 days. Luckily, I knew there would be a second opportunity in two weeks, I immediately sent an email to my son Pål Jørgen and asked if he would be able to join me. Pål Jørgen and I flew to Milan on Friday morning, picked up a rental car and drove to Madonna di Campiglio. We were ready to hike by 1730 and had already called ahead to Rifugio Alimonta, informing them about an estimated arrival time of 2000. Pål set up his normal, fast pace and we arrived already at 1945. The friendly hut-keeper looked at us and said "you need to stay outside for another 15 minutes". We were immediately served an excellent dinner, our surprise was genuine when the "big beer" turned out to be full one litre mugs. Most alpine huts consider a "big beer" to be a half litre glass. The next morning was gorgeous. 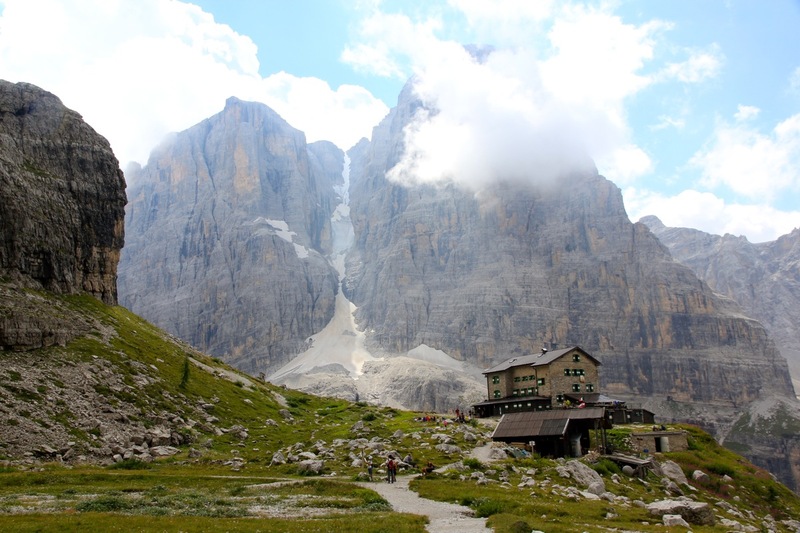 The Alimonta hut has a spectacular location with vertical mountain walls around. 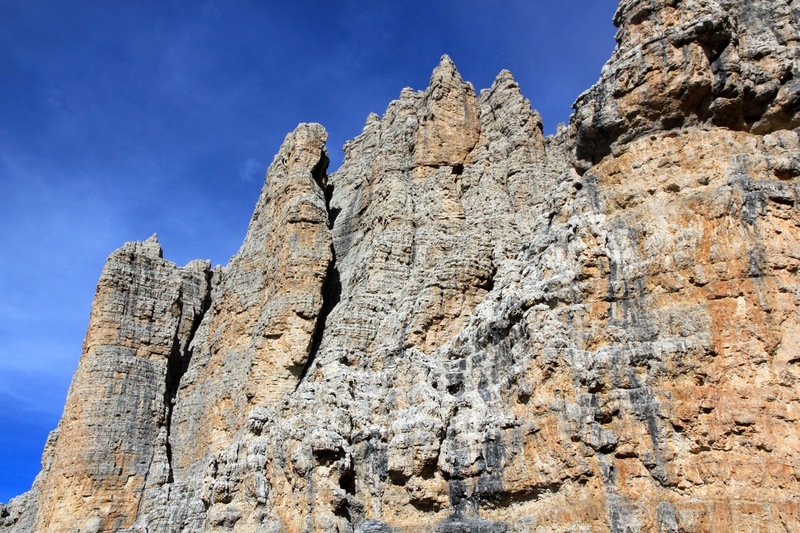 The sky was clear and the sharpness of the cliffs made them even more imposing. We left the hut at 0715 and had a nice walk downhill to the small valley where the route starts. We left one backpack and a few items at the base of the gully, then ascended to the top of the scree. This first aection was familiar to me and we quickly climbed up the small ridge passing two short sections above my previous turn-around point. These were both (YDS) class 4. 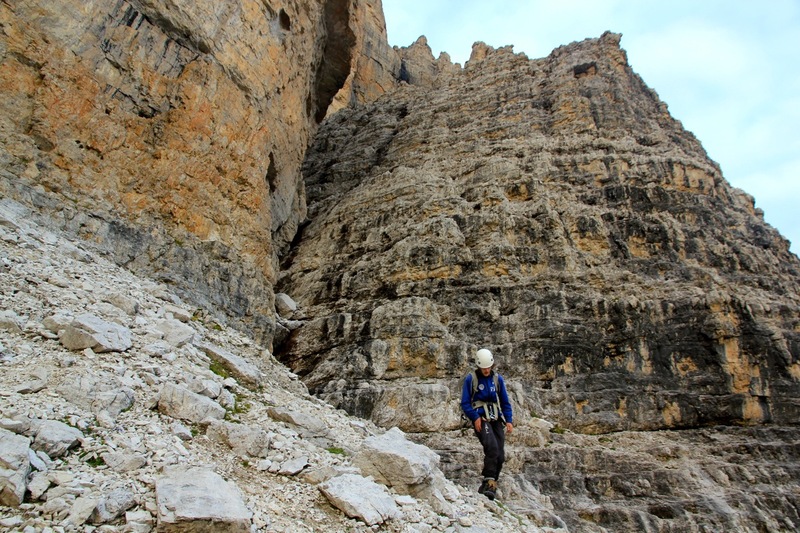 At this time, we agreed that we most likely would prefer a rappell on our return at this location. 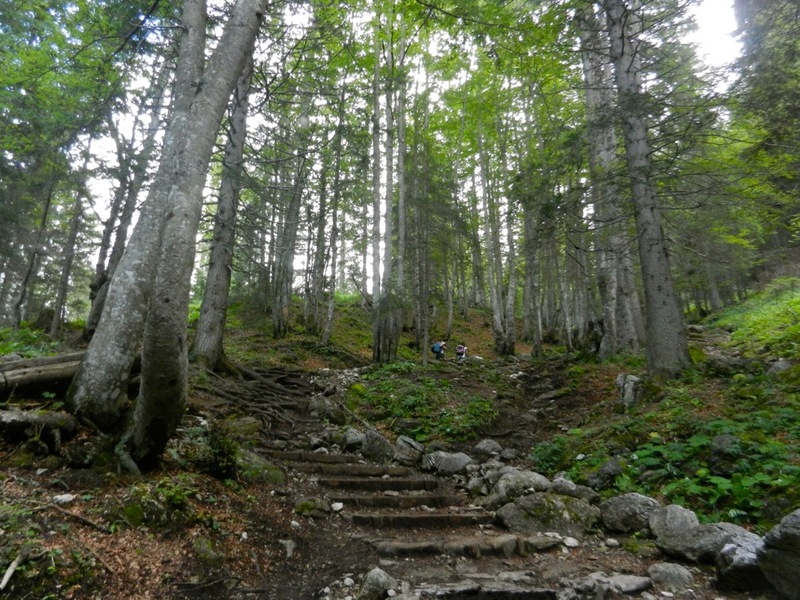 The continuation was more easy ground, we then discovered a faint climbers trail crossing the next slope. Quite surprisingly, another deep crack had to be crossed and the trail led to a perfect crossing. An interesting ledge that carried us far enough to get safe ground below. Also a good example of terrain that would be easier on the return since we would then start from below and enter the ledge a bit further out. 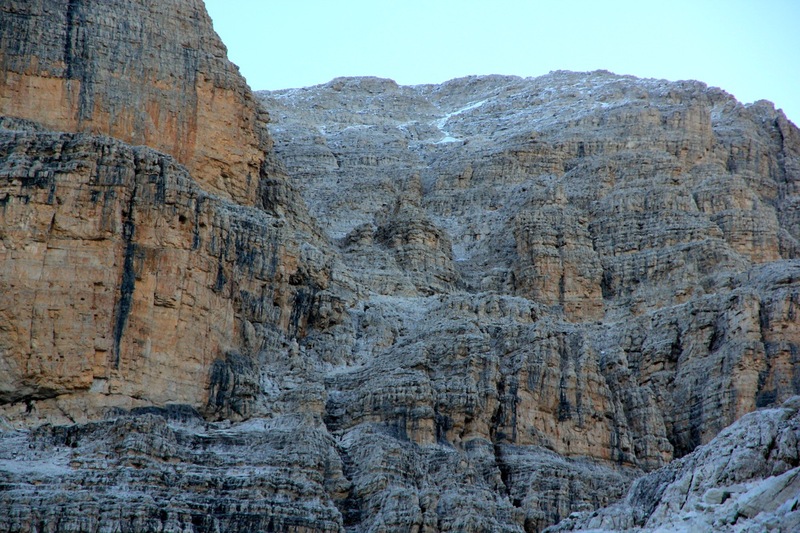 From now on, as we climbed, we could look across to Cima Tosa and see how well we were doing. Such a comparison seemed more encouraging than looking upwards. From here, the best route climbs higher (more left) and this was poorly marked. 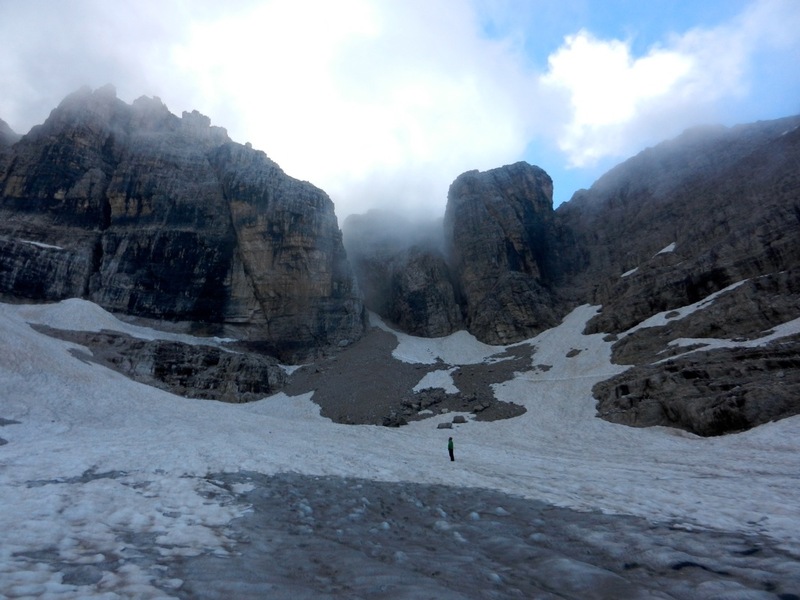 We finally entered the main gully/crack that separates Cima Mandron from Cima Brenta. We looked at the high entrance along a narrow ledge, but quickly agreed that a much safer access would be to go low and then ascend the wall on the opposite side in order to get into the gully above the big chockstone. Next followed a stretch of scrambling higher on the wall with the two stripes. 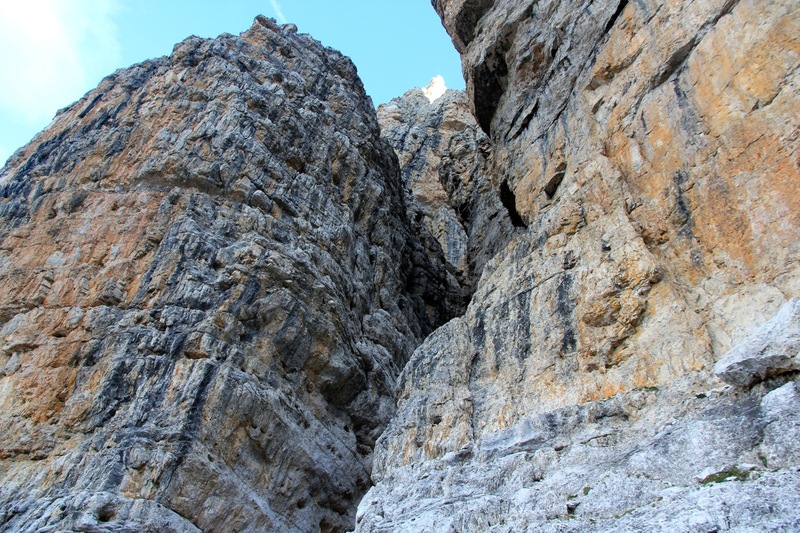 There are many ledges and one can probabely find a reasonably easy way up. However, we carried a 60 meter rope and decided that we might as well use it and climb more directly to the top from the ledge we were on. Pål would lead and I would follow. 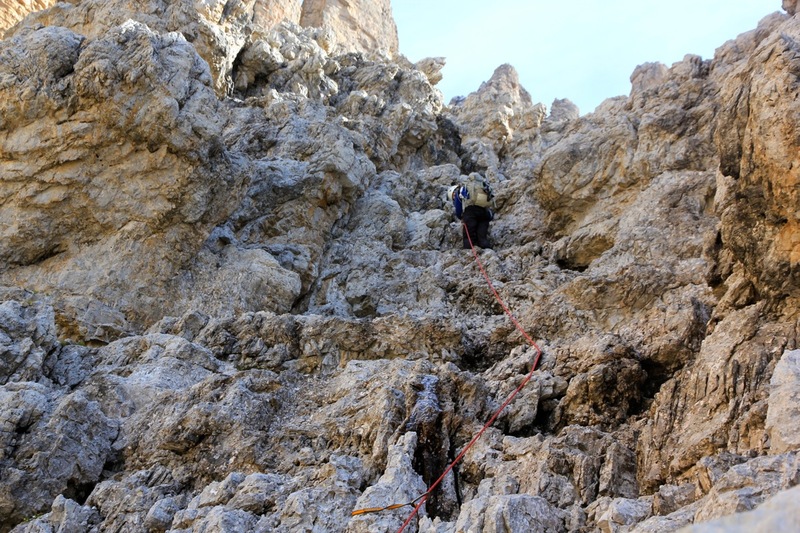 We climbed two lengths, they were both less than the full rope, before getting onto a more gentle slope. While Pål put the rope back into the backpack, I proceeded up and across a short flat section, then again uphill, but on an easy slope. I looked back and noticed Pål coming across the flat section behind me. I continued uphill among the rocks until reaching a small cairn, obviously indicating that we were on route. As I turned around, I did not see Pål. Mysterious, I shouted his name and "where are you?" No reply. Hmm, could he possibly have picked a route more left, and still be behind the ridgeline there? I scrambled across and looked. No sign. More shouting, deep silence, only the echo from the steep cliffs on my right. This was indeed very unexpected. I decided to scramble back down to the spot where I last had seen him. No sign. Thinking about what possibly could have happened, I came to the conclusion that he somehow, did not notice where I went, and that he had taken off along the pretty wide ledge that extended sort of horizontally to the right. However, I could not see him for as far as I could see. Well, I had no desire to start hiking along a ledge that clearly was wrong. 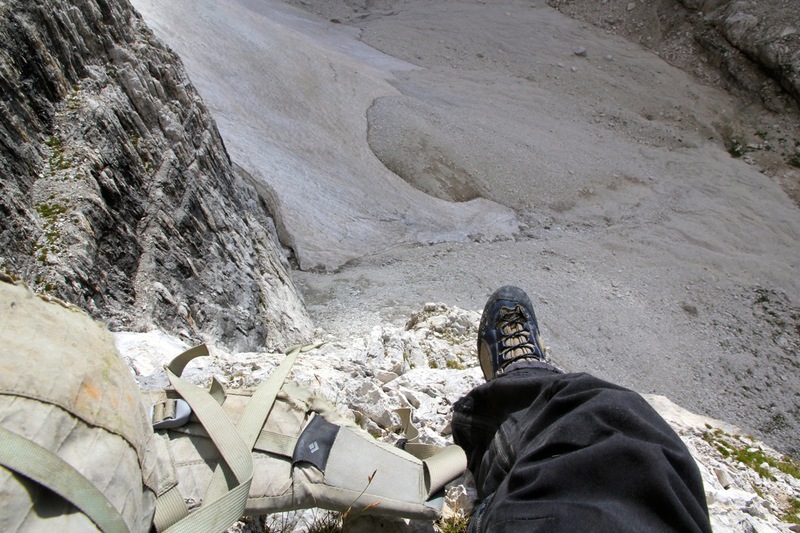 As far as I could understand things, this ledge would eventually get Pål below the point from where to continue uphill on Cima Brenta. Most likely, the ledge did not continue that far or it would in any event run into more difficulties. A full hour had passed and it was beyond me why he would continue for so long without seeing me. 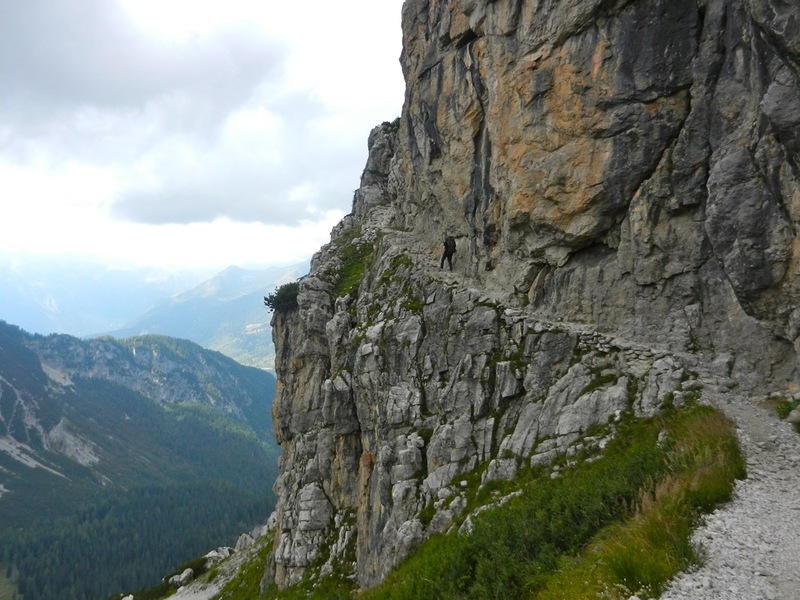 I reclimbed the local hill and continued all the way around a corner to the lower part of the final climb to Cima Brenta. Shouting again, this time having success, Pål answered from somewhere way below me. The terrain from there to here looked ugly and I shouted back that he had to return all the way back to where he saw me lasttime, then ascend and get over to here. I sat down in the sun and waited, about 40 more minutes and he fianlly appeared. This trouble had taken a bit more than two hours. It is kind of hard to believe that such things can happen. Pål agreed that with a little bit of thinking it should have been plain obvious that i could not possibly have been ahead of him along such a precarious ledge for such a long time. I learned again (the last time was on Antelao) that one needs to stay extremely close to a partner, never ever pull ahead. We decided to drop the crampons and ice axes, it was pretty obvious that the little snow that remained on this south slope would not cause any problems. The remaining climb was not difficult, but still quite sustained. There is very likely some easier route, but we preferred to stay more or less on a line and get to the main crest. From there, it was a short and easy walk to the summit and its small marker. We arrived at 1415, 7 hours after the start, however at least 2 hours were wasted due to us getting separated. There is a fairly short, almost level summit ridge. 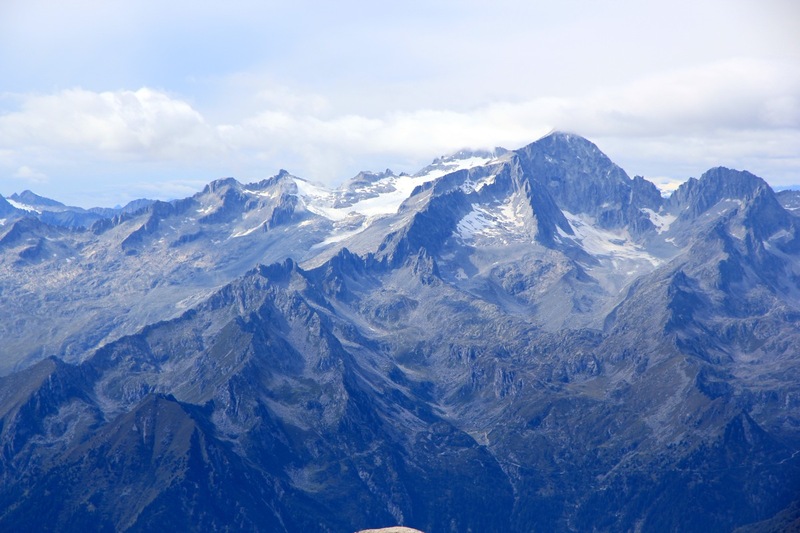 The view was pretty good, but some haze prevented the ideal, very sharp view of peaks and ridges. 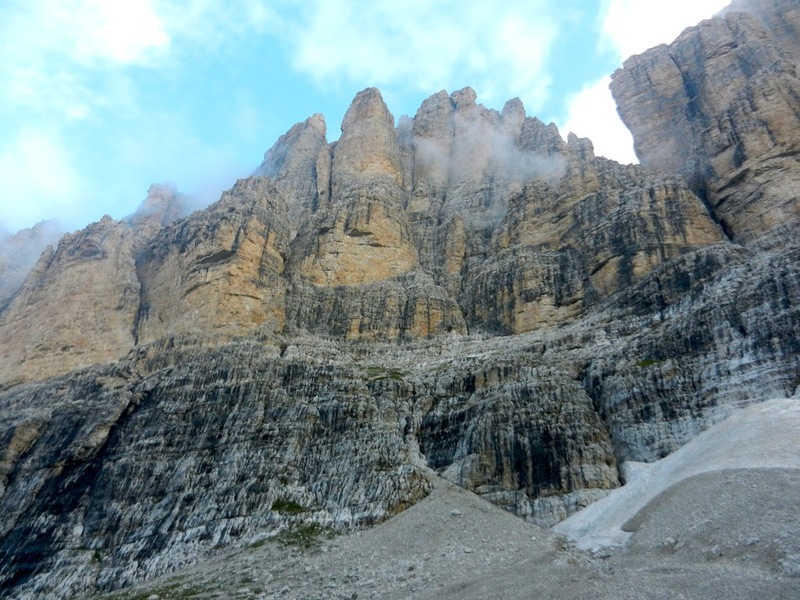 I took many photos of Cima Tosa in order to secure at least one good picture that can be used to analyze the elevation. 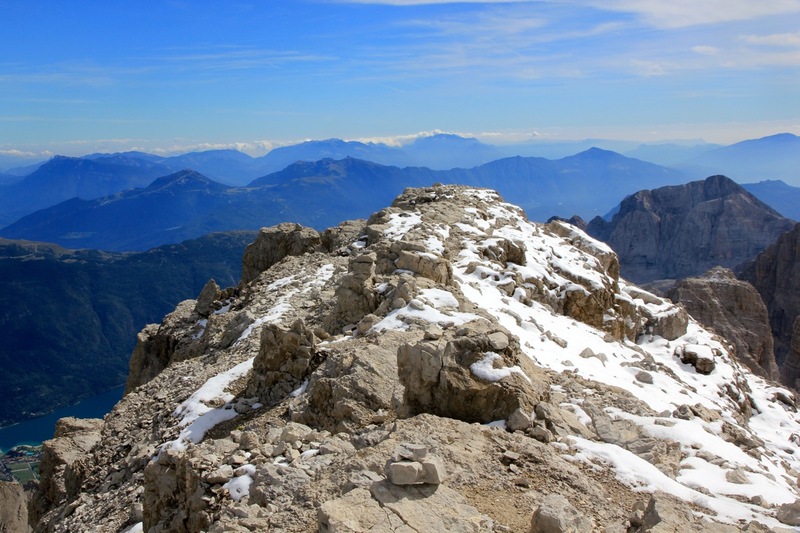 This is obviously not a frequently visited summit, we saw many more people on Cima Tosa, most likely because they think they are climbing the highest point. Also, I decided to take 3 readings of the summit elevation as measured across a 5 minute interval (each time) using the average option on my Garmin GPS. 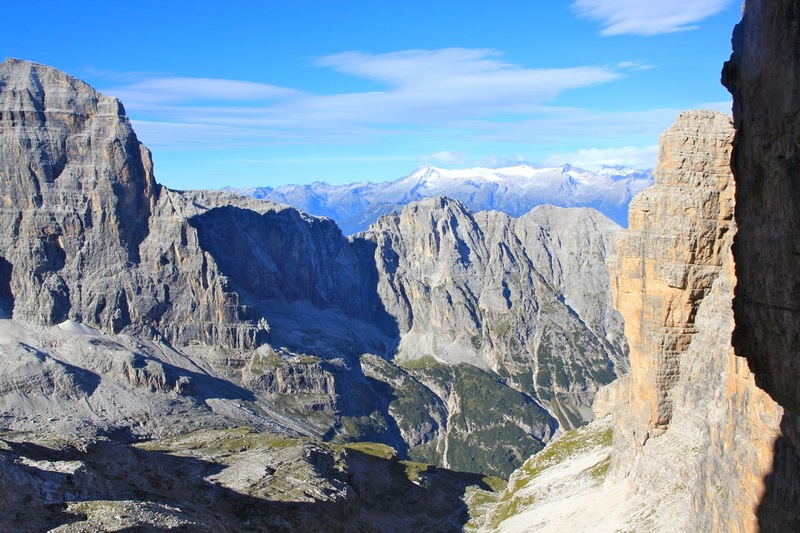 The summit even provided a nice view directly to the north end of Lago di Molveno, a popular place to start hiking in the Brenta group. We left at 1445, knowing that the descent would also be quite long. 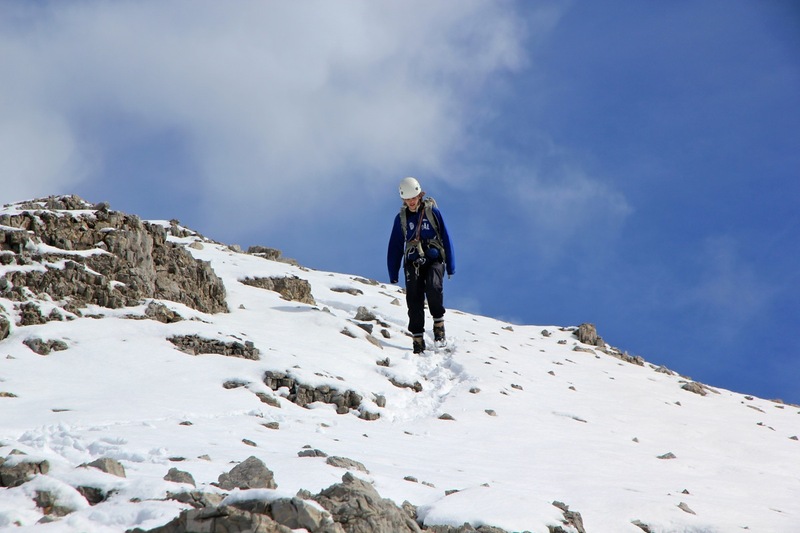 The downclimbing to the place were we had left our crampons and axes went smoothly. Back at the steeper wall leading down to the dividing gully, we decided to do two rappells, each 30 meter. This got us safely down at the (trival) price of leaving two solid anchors (each with a backup) in the wall. 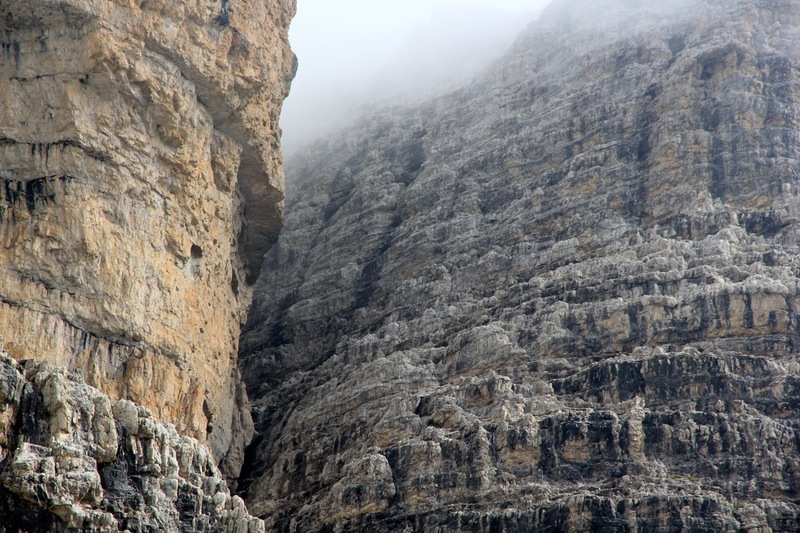 What remained was the two short but steep pitches at the initial ridge/rib. 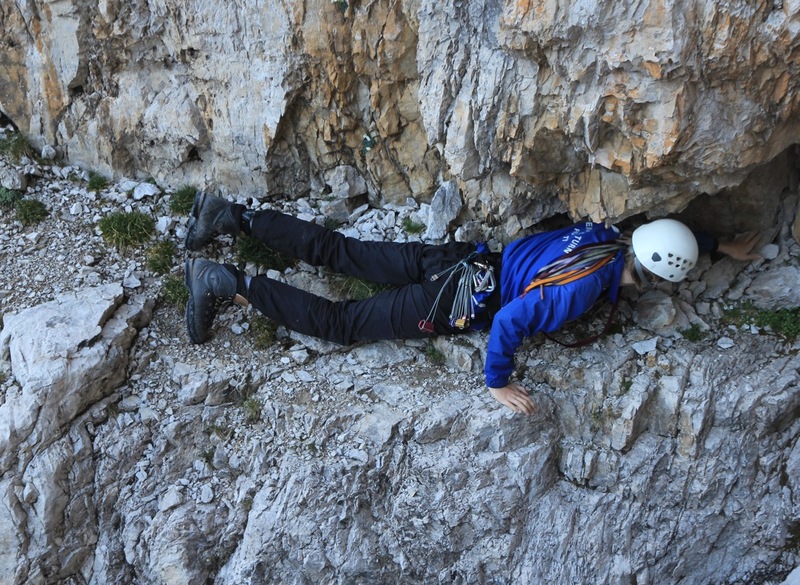 By now, we had done so much down-climbing that this also could be done without using the rope. 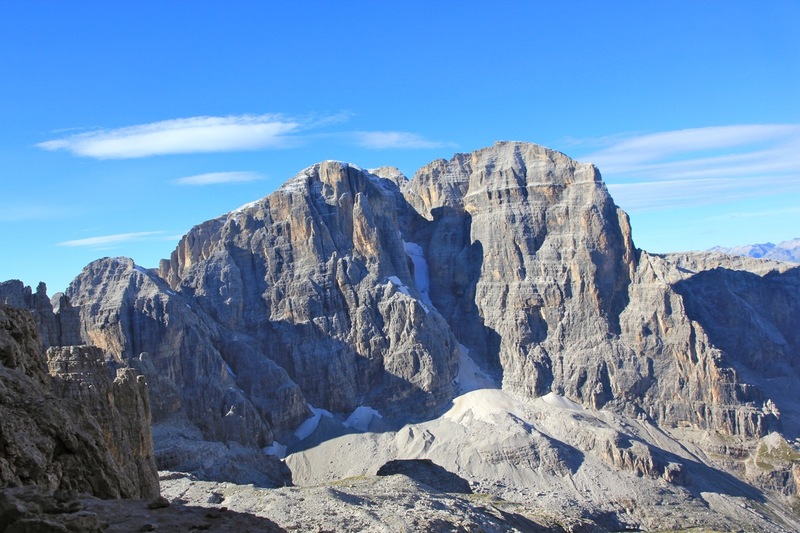 Still, a long and careful descent, we agreed that our most attractive option would be to hike back up to Refugio Alimonta and spend a second night there. Arriving again at 1915, we felt that dinner was well earned. The next day we had an easy walk out to the parking area, then departed for Milan. Pål should fly back to Norway early the next morning, while I headed up to Lugano where the welcoming reception for DD22 would take place later in the evening. I owe my best thanks to Pål Jørgen. 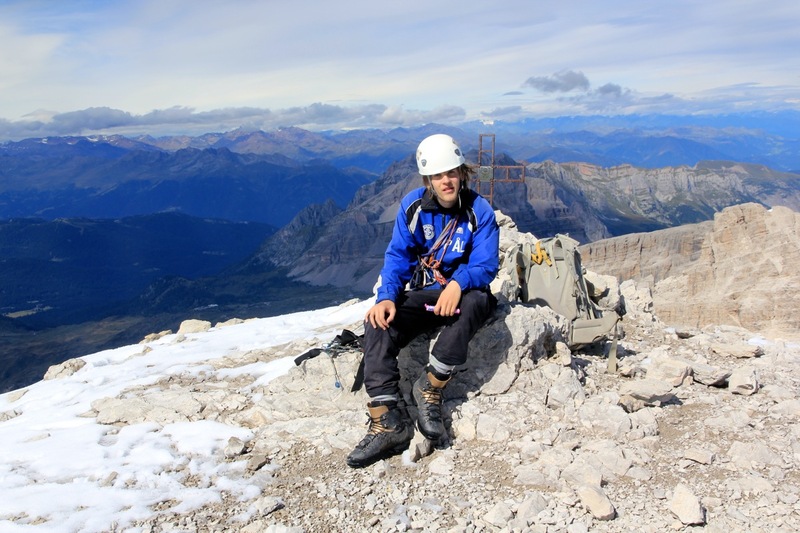 He says yes on short notice and provides good company and essential contribution in order for his dad to get up on this rather steep mountain. 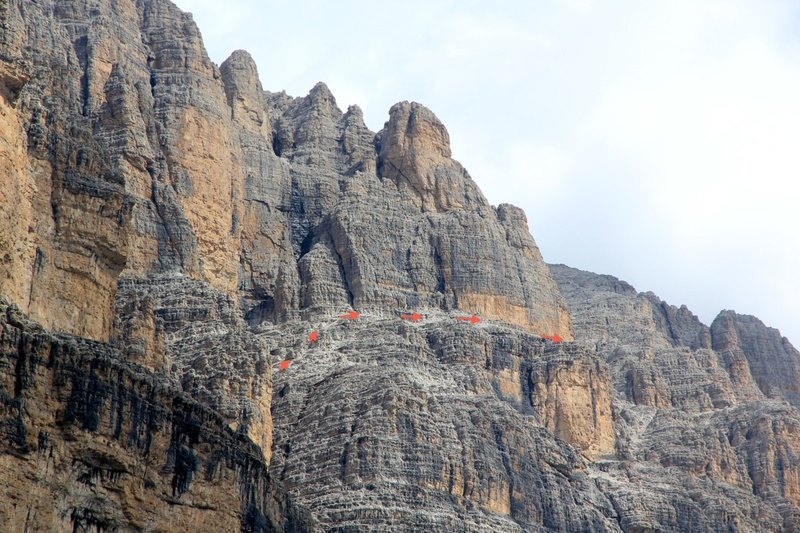 What is the prominence of Cima Brenta? 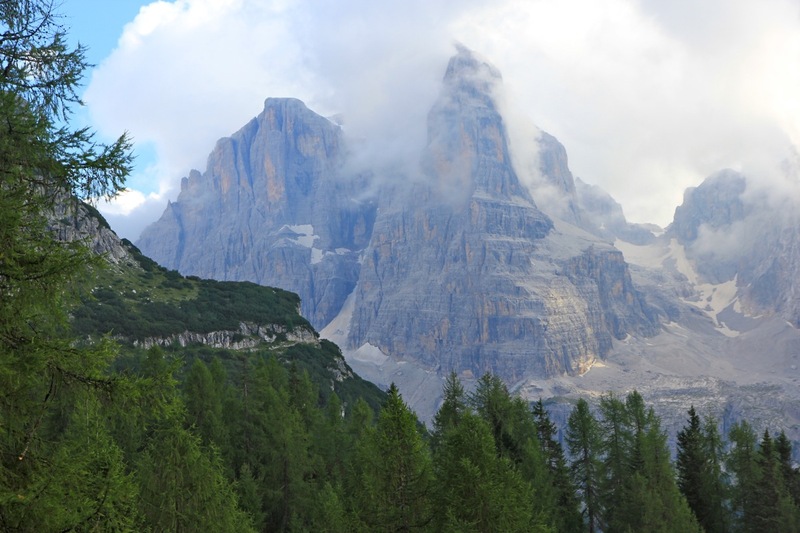 This mountain is at the center of several mysteries related to understanding which mountain is at the lower end of the list of European ultra prominent mountains. 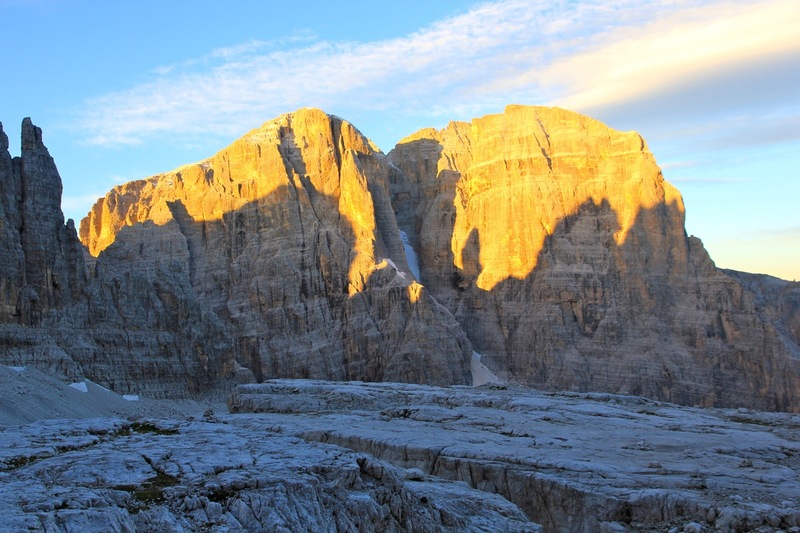 The story started on July 19., 2009, when Pål Jørgen and I climbed Cima Tosa Cima Tosa was, according to all maps, the highest in the Brenta group, however, our climb of Cima Tosa provided strong evidence that we really should have climbed Cima Brenta in order to ascend the highest local peak. 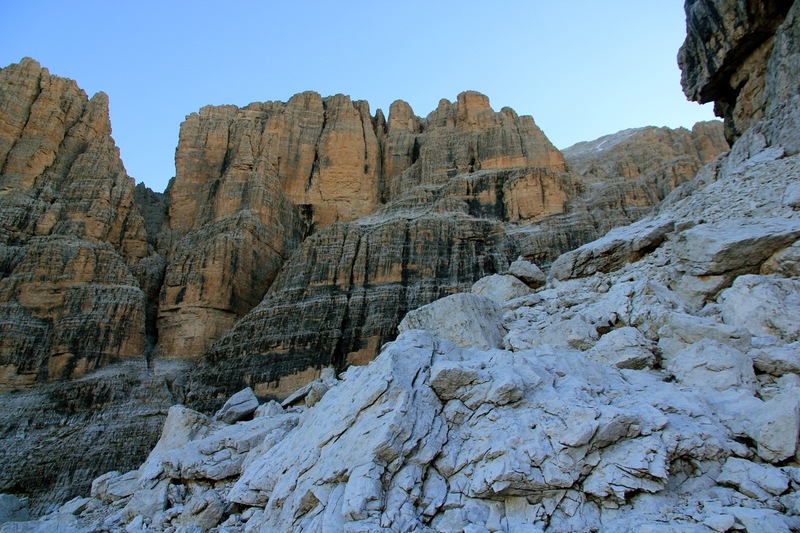 Additionally, this information has left it highly uncertain if Cima Brenta is an ultra prominent mountain or not. 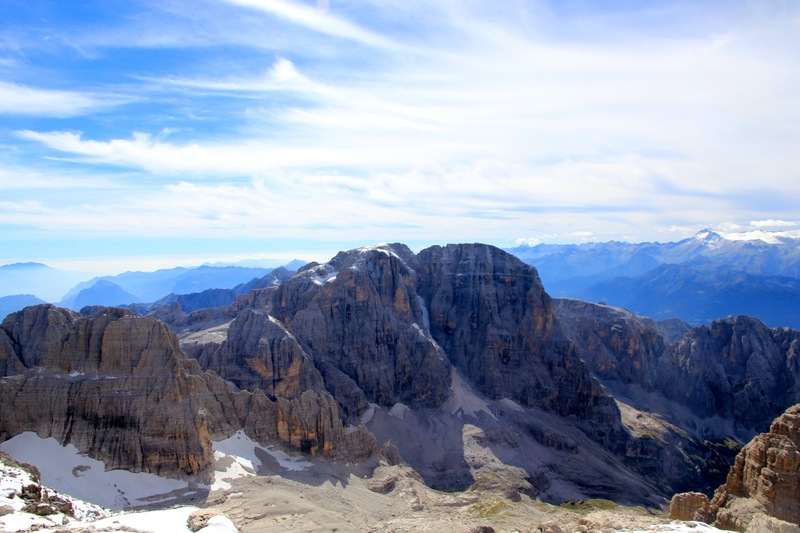 Cima Brenta has a map elevation of only 3151 meter, this is close to 1500 meter above the saddle on the golf course north of Madonna de Campiglio. 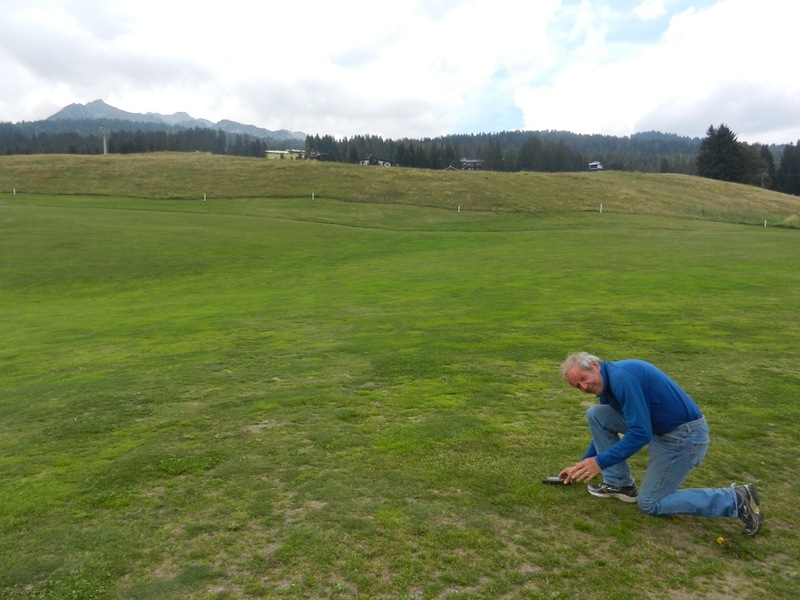 The saddle on the golf course was measured by my Garmin GPS taking two different measurements each doing a 5 minute average. The results were 1655m and 1658 meter, ie. an overall average of 1657.5 meter. 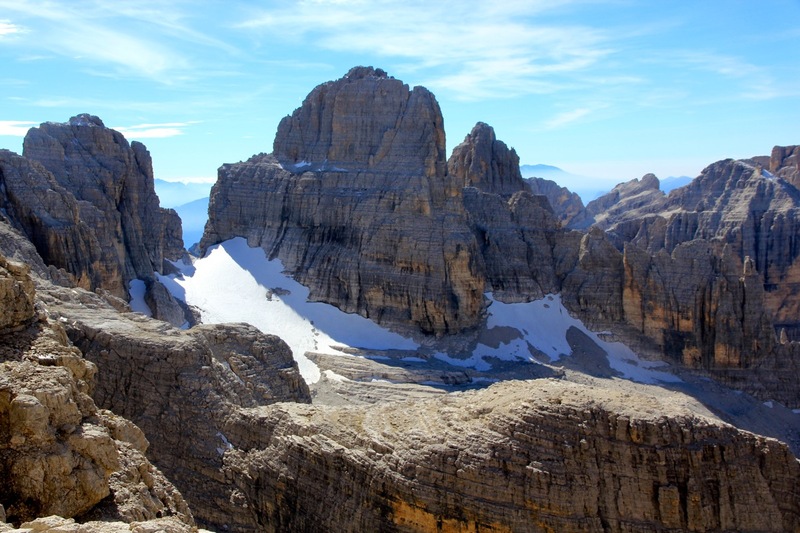 Similarly, the summit elevation of Brenta was measured via 4 separate measurements, all with averaging, for a total of 20 minutes. These results varied from 3159 meter (lowest) to 3166 meter, with the average value being 3163.3 meter. Based on these measurements (using the same GPS unit), the difference between saddle and summit is 1506 meter. Taking upper and lower limits, these measurements estimate the prominence of Cima Brenta (provided Brenta is higher than Cima Tosa) to fall in the interval from 1501 meter (lowest) to 1511 meter (highest). 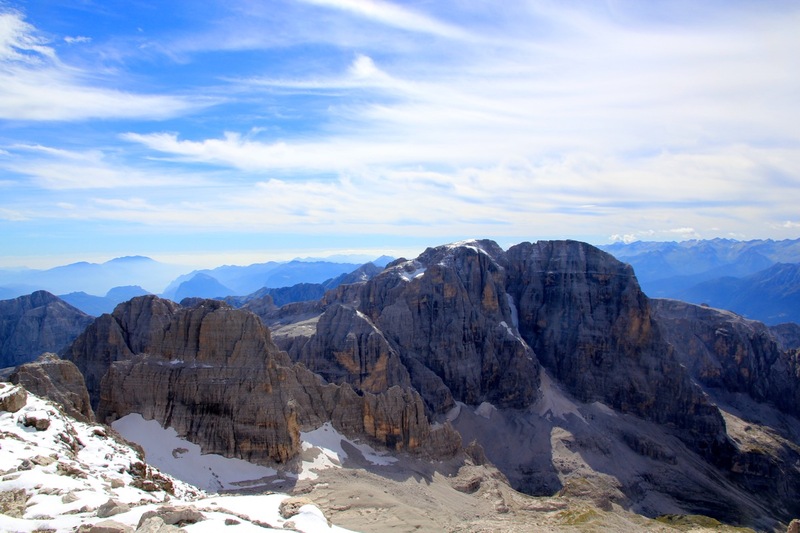 As the figures clearly indicate, there is significant uncertainty, however, the results support a conclusion that it is more likely that Cima Brenta has prominence exceeding 1500 meter than the opposite. Cima Brenta, as seen from Cima Tosa. 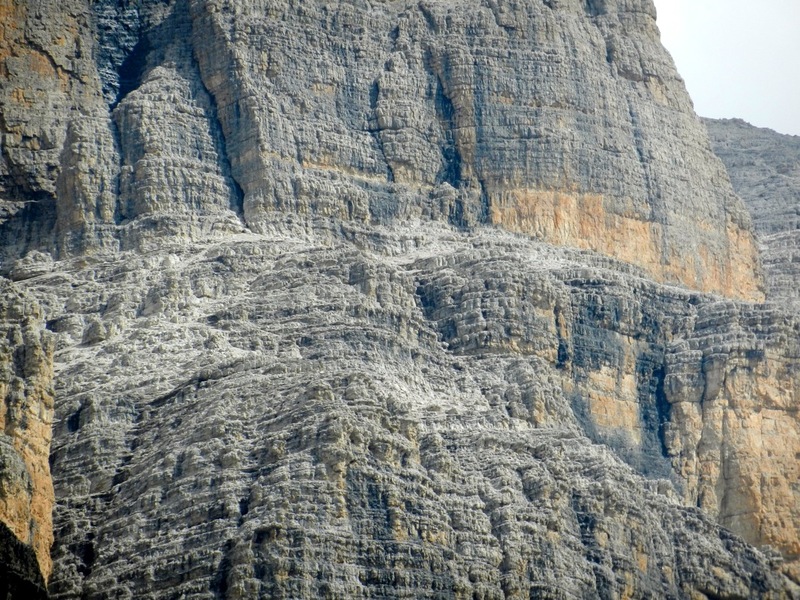 Cima Tosa, as seen from Cima Brenta. Cima Tosa, High resolution for analysis. The steepest part is behind us. Summit Panorama I, looking west to Adamello, then towards north. Summit Panorama VI, Cima Tosa to Adamello.